New York artist Audrey Flack attained art-world fame for her Photorealist painting before turning to sculpture in the 1980s. 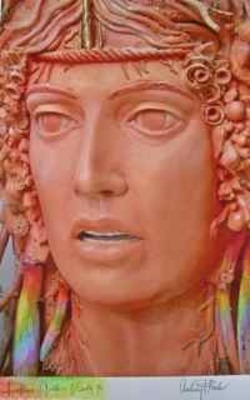 The print is based on her large-scale 1996 cast sculpture, Daphne (a version of which is now sited in the lobby of UND’s Education building). Though inspired by Greek and Roman art in both its subject and style, Flack’s Daphne was conceived as a contemporary feminist icon. The bullets on Daphne’s head make reference to the issue of violence against women in today’s world.